Sometimes the challenge in reading a book lies in negotiating its different threads and clambering over complex language that is so clever and slippery that you’re constantly on your mettle as a reader. But sometimes – ah, sweet relief!- the book itself is so easy to read that you just lie back and let it sweep you along, only to find yourself rewarded with layers and counterpoints that emerge long after you shut the book. 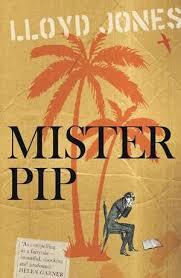 Mr Pip, for me, was such a book. Pop-Eye, or Mr Watts, is the last remaining white man on Bougainville after the implementation of the blockade by Papua New Guinea in 1990 and the descent into civil war between the ‘rambos’ (village boys who joined the rebel insurgency) and the ‘redskins’ (PNG soldiers). Fourteen year old Matilda lives on the island with her deeply religious mother Delores, her father having travelled to Townsville for work with the Australians and unable or unwilling to return because of the civil war. Successive raids by the rambos and the redskins have left the village in tatters and Mr Watts offers to teach the school, in the absence of any other alternative teacher. What Mr Watts brought to these children was Charles Dickens’ Great Expectations: a book which, at first sight, could hardly be more removed from the experience of these village children, or their parents. Mr Watts invited the parents into the schoolroom, where they shared their own stories with the children, and the parents too, came to know of ‘Mr Pip’, Miss Havisham and Estella through their children. Mr Watts was always an outsider. He was quite frankly eccentric, pushing his demented village wife around the village in a shopping trolley. But somehow he managed to interweave the experience of Pip and his great expectations into the shared knowledge of this small Pacific village. The book changes direction abruptly and I don’t want to spoil it for you. There is a coda to the book where Matilda, as an adult, revisits Mr Watts’ hometown, trying to fill in more of the paradox and mystery of ‘Pop-Eye’ and his wife. What she learns there gives the narrative yet another twist, unsettling much of what has preceded this. Despite its simple, flowing almost-fable-like language, this book has multiple levels. I found myself thinking about it long after I’d finished it. I agree, it was a great book. I think it was shortlisted for a major prize, maybe the Booker?